I'd like to see Warriors Within first. 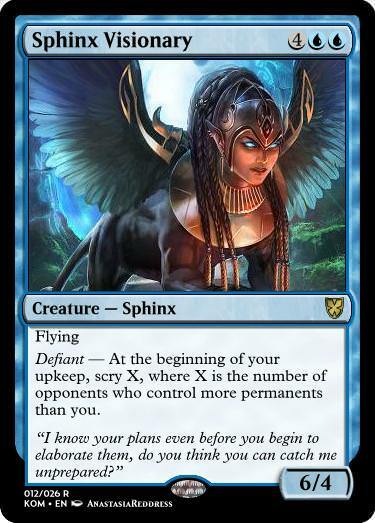 Today I'd like to take a look at this set's new mechanic: Defiant. 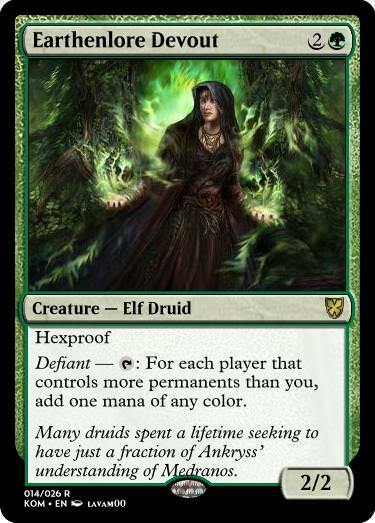 Defiant is an ability work that gets better with each opponent who has more stuff that you. 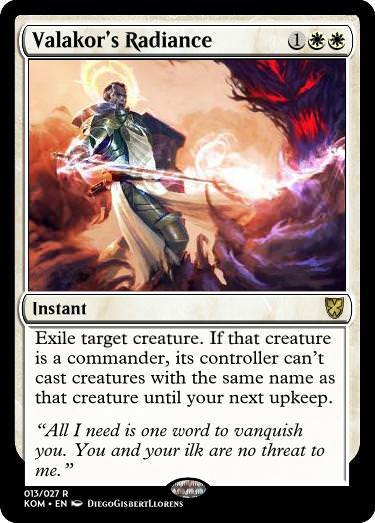 Since Commander is a format in which people tend to amass a ton of permanents, why not get some value out of opponents who do? If you want any specific character/deck spoiled, make sure to vote! Also, I'm curious, would you guys be interested in doing community spoilers? If so, let me know! 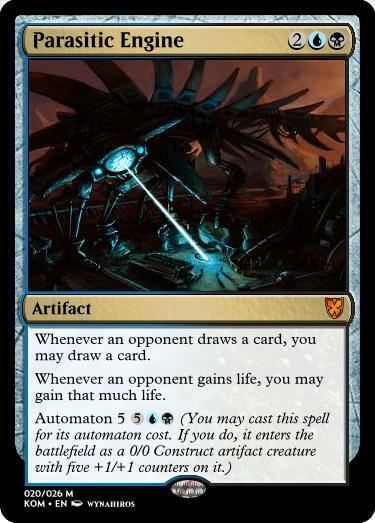 As promised yesterday, today we're gonna have a look at cards that have mechanics that have never appeared in my sets, but which will appear in future sets of mine, here we go! 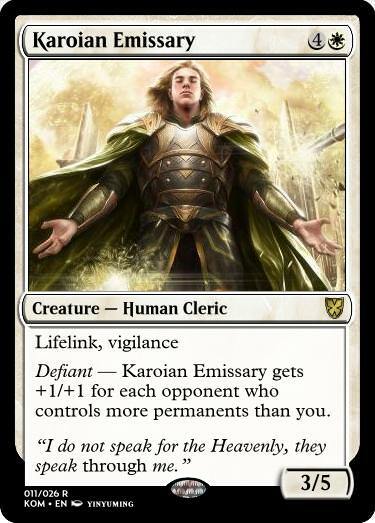 So Herzi actually beat me to this mechanic that was waiting on the Korrinayru block to make its debut, but until I can think of a new name for it, I'm keeping it. 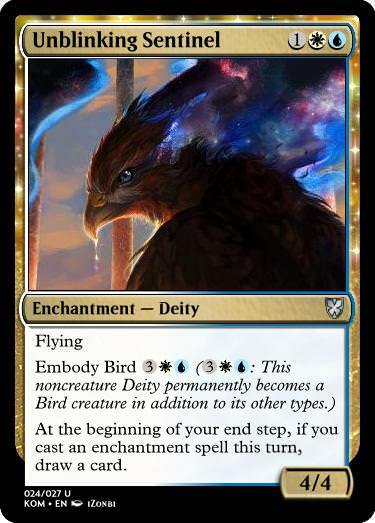 Deities are a new enchantment subtype that have P/T much like Vehicles, but unlike them, their Embody ability will allow them to become a creature permanently. The Rammaneth block will show a harsh world with a punishing environment, where the only safe places are the oases, which are becoming extinct. 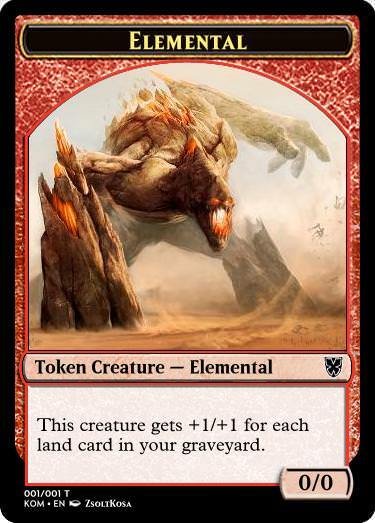 In order to survive the desert, the Endurance keyword allows your creatures to become stronger for surviving the many threats of the world. And that's it for today, let me know what you guys think! 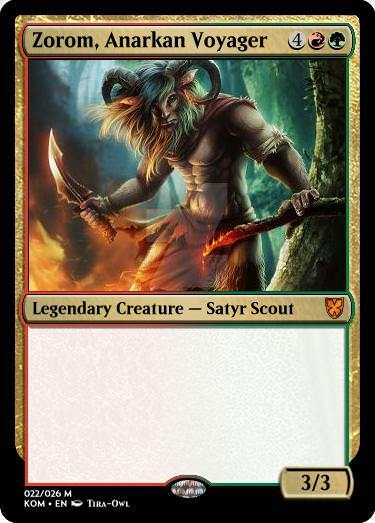 Tomorrow I'll start revealing the commanders and their decks, so stay tuned for that! The sun wouldn’t rise for another hour, but the device in his room was calibrated at the exact angle to diffract rays of light that had yet to reach the horizon and amplify them into a light pointed directly at his dark face, waking him up. “Another day of hard work” said Hertrioss drowsily as he got up. He got dressed and grabbed a loaf of bread and bottle of water his employer had left on top of the bed for him last night. He envied the fact that by the time his employer woke up he’d already be sweating after two hours’ hard work, and he’d still have to go for another couple of hours before he got his lunch break. Such was the life of the Lubryoss, the working class of Demmurya. 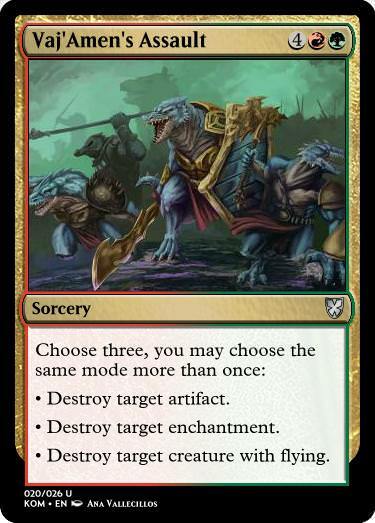 While the Vollta could just relax and rule society, Hertrioss and his kin were forced into doing their manual labor but, as Sibreena Omenspeaker claimed day after day, this was all for “the greater good”. Many had tried to confront the Omenspeakers, but unfortunately Sibreena and her advocates had a weapon none of them could fight: the gift of Sight. The rulers of Demmurya could see into the future, therefore they could plan to snuff out every rebellion before it even began. “We know what’s best for you because we’ve seen what’s best for you. You can trust us, it’s all for a better Demmurya” Sibreena would always say. 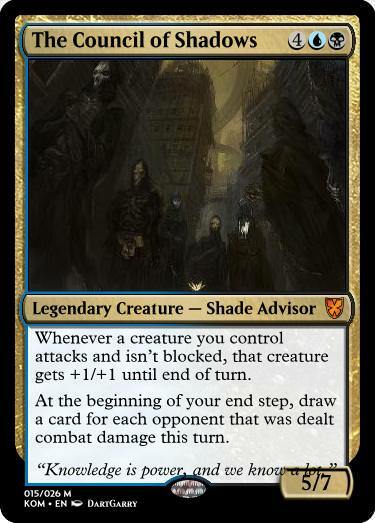 Hertrioss had had rebellious thoughts for weeks now, and if they hadn’t come for him yet, that meant he would never act upon them, and he was destined to end his life as a mere puppet to his vedalken master. One hour was left for his break, and Hertrioss was already in the center of Speeralis when he saw something that was unfortunately more and more common these days: a Vollta elf was beating up one of his goblin servants for dropping some goods. What added insult to injury was that the Lubryoss could do nothing about it, so they just walked by keeping their heads hanging low while the Vollta impassively saw the brutality, some even with smug faces. “This is so…” began Hertrioss as, to his surprise, his body seemed to move on its own, running towards the Vollta and tackling her, taking the belt she had in her hand and whipping her with it. Everyone was dumbfounded, and soon the Vollta were screaming for someone to put an end to the madness. 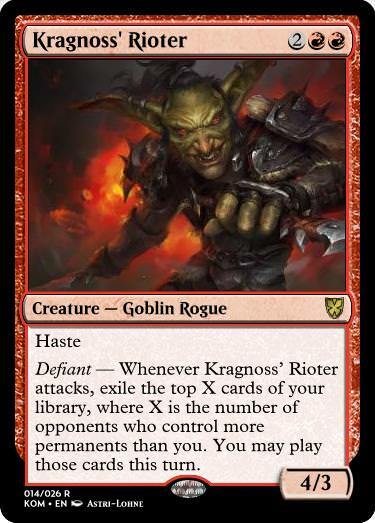 Realizing what he had just done, and knowing he’d probably be killed for it, Hertrioss looked at the goblin and extended a hand towards him. The creature took it and got up, then they both began running. It wasn’t long before white, green and blue bolts of light shot behind their backs: they were being chased by the peacekeepers! As Hertrioss pushed past an overweight vedalken blocking his way, he tripped and fell. This was it, the last attack had come too close, and he knew he wouldn’t be fast enough to get up and keep running before they caught up to him. But as he turned around, he realized something he never thought would happen. 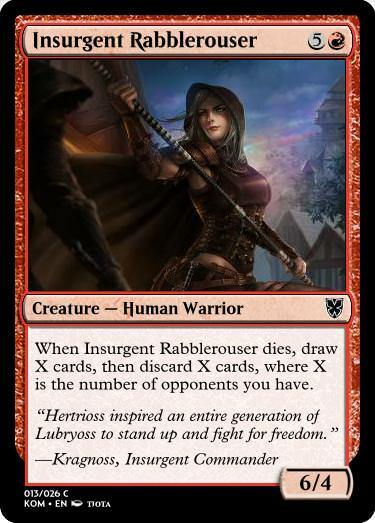 The reason all the attacks on him had missed was that many Lubryoss had actually began fighting the peacekeepers to stall them, and about a dozen of them were running behind him, a look of joy and rebellion illuminating their faces while the adrenaline kept them going. Hertrioss felt someone pull him back to his feet and saw the goblin he’d rescued standing right beside him. They both nodded and kept running, if they had made it this far, then maybe they could actually make a change for once! 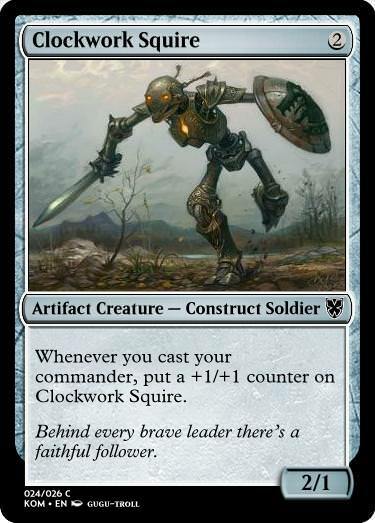 But when they got to the gate, they were greeted by an unpleasant sight: dozens of peacekeepers stood at the gate, led by none other than Vorreia, Sibreena’s right hand. 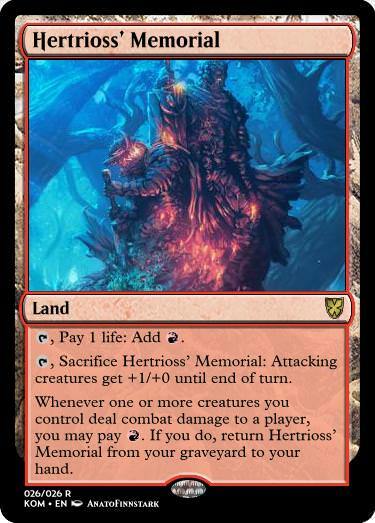 “I guess this is the end of the road” said Hertrioss. But before he could assault her, however, she turned around and commanded the peacekeepers to retreat. The man didn’t understand her behavior at first but, when he saw the bomb fly past him, he got it: some Lubryoss were assistants to artificers, and they carried their weapons! Hertrioss jumped back as the bomb exploded against the gate and made it collapse, the chunks of rock hitting him but not causing him any major harm. Vorreia, on the other hand, had been too close to the explosion, and the man could not be happier when the smoke dissipated and there were absolutely no signs of her, as though she had been vaporized. As he fainted with a smile, he felt people grabbing him and carrying him away. He couldn’t tell who was taking him or where, but he didn’t care, he’d hurt Sibreena and her miserable society, and he’d stood up for himself, so if he died, he’d die happy. As the cold water splashed on his face, he was startled awake. Kragnoss’ crooked grin greeted him as soon as he opened his eyes. 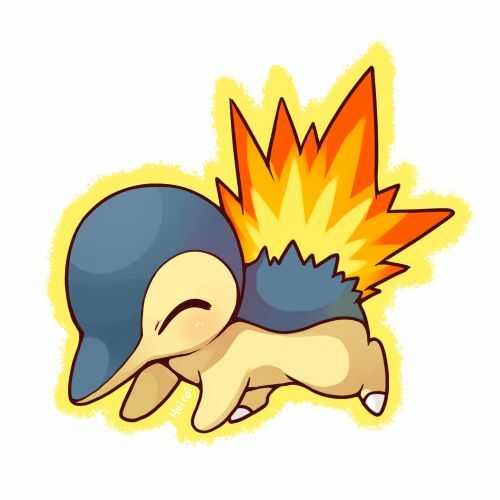 Hertrioss smiled as he struggled to get up. His wounds were still fresh, but his ecstasy allowed him to ignore the pain. “The battle is not yet won, for there are still many Lubryoss that are enslaved to the Vollta. Today we won our first battle, but not the war. Today we took a stand, today we earn a new name. Everyone cheered him and, for a few seconds, he felt like the king of the world. It would take a lot of time and planning, they’d first have to settle in the Outlands, and that would be no easy task, since the Omenspeakers had always claimed them to be inhabitable, that nobody could survive more than a few minutes outside of Speeralis (clearly a lie). There was also the gift of Sight; for some reason Hertrioss had managed to elude the Omenspeakers’ omnipotent gaze, or did they let him escape because they had something else in mind? They had been lucky this once, would that repeat itself in another opportunity? Maybe someday the Vollta would finally be overthrown, but the Insurgents would have to work harder than ever before to make that dream come true. As he followed Kragnoss through the woods, he mentally checked his plan for that day: he’d have to try the new weapon of psychic interference before nightfall to see if it needed adjustments, and he didn’t know how long that would take. 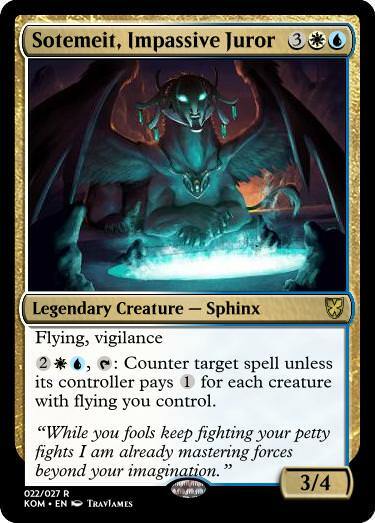 He felt like there would never be enough time in the world to finish everything he’d set out to do in order to assault Speeralis, and he couldn’t really afford to lose time. But this was important to Kragnoss, and to a certain degree it was important to him. He’d grown quite fond of the goblin over the last few years, he was a fierce warrior and a surprisingly good strategist. 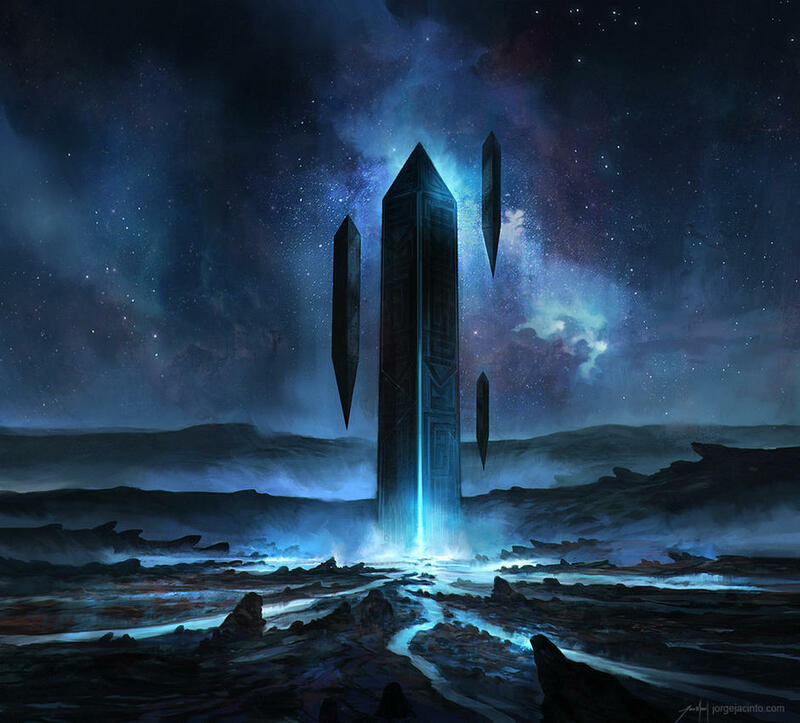 Kellythross stood in front of the monument in solemn silence. 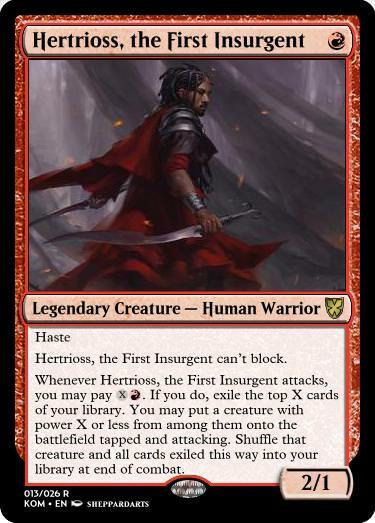 He’d never met Hertrioss in person, but since he’d joined the Insurgents he’d heard a lot of the man’s deeds: the day he stood against the Vollta, the day he commanded the Insurgents into Speeralis with psychic distortion equipment that allowed them to liberate thirty more Lubryoss in one night before the Omenspeakers could even realize their Sight had been tampered with… and the day he’d been fatally injured while trying to save the kids of some Insurgents who had been taken as hostages. 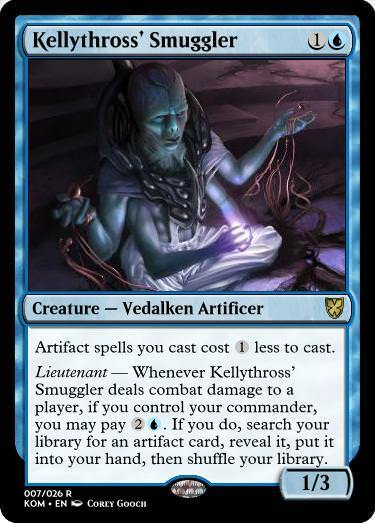 “You’ve given me shoes too big for me to fit in, but I’ll do my best” said Kellythross staring into the eyes of the statue, as if hoping to find him and his wisdom in there. Kellythross didn’t know how to respond to that, he saw the goblin’s eyes holding back tears, and realized he was probably waiting for him to leave in order to cry (he was surprised to find out that goblins could actually cry). Kellythross nodded respectfully and left. Kragnoss turned to the monument and began crying. “He has what it takes to bring us to victory, I know it! 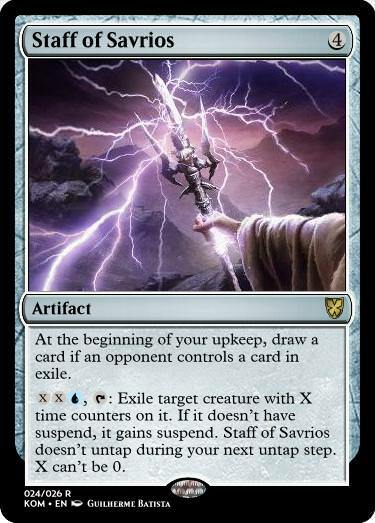 Your sacrifice will not have been in vain!” he said to the memory of Hertrioss. This is today's first story, I don't have the time to upload Fatresya's so I will do it later, along with some more cards, hope you enjoy it. 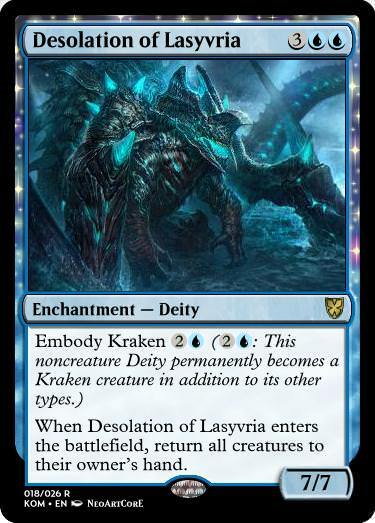 It was just another day in Rammaneth, or at least that was what Fatresya thought. As she bowed before her Pharaoh, she listened intently to the new information his minions had received: a new oasis had been found a few kilometers away from the Kharada pyramid, where they were right now. Fatresya bowed with a smile and turned around, leaving the pyramid and preparing her party for the raid. The Pharaoh was the oldest Rammanethi to still be alive, and even though his desiccated skin, the few brittle strands of hair he still had left and his hollow eye sockets gave away his age, he actually had more stamina than the entirety of Rammaneth put together. The secret to his power? 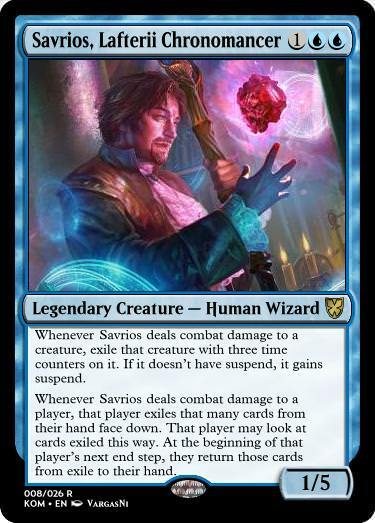 He’d relied on ancient magic to extend his lifespan beyond any mortal’s, and he’d been generous enough to share it with his servants. Those who swore allegiance to the Pharaoh (Fatresya included) would not only live longer, they would also tire less often, require less sleep and could go days or even weeks without a single drop of water or a single bite of food. But unfortunately, not everybody was willing to bow to the Pharaoh. 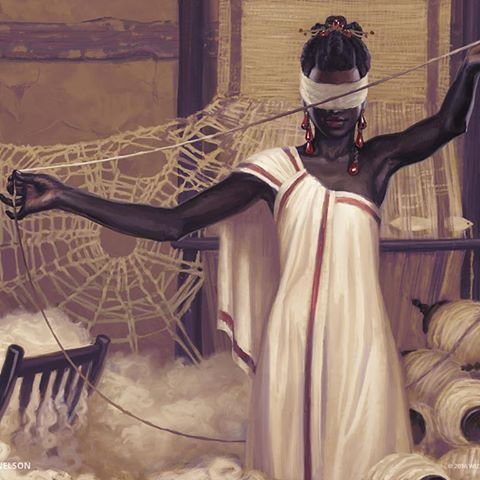 The Onuris, the Senbu and the Nekbesa were tribes that had found that the oases of Rammaneth had a curse that could kill whoever was under the Pharaoh’s influence, and they were plotting to kill him, so Fatresya had begun a crusade to kill every last one of them! She had already spent hours traversing the desert under the scalding sun and the dry atmosphere, but the Pharaoh’s blessing prevented that from hurting her, she was practically invincible, who would ever want to defy someone so generous as to share such a gift? The answer came to her a few seconds later, when she saw the oasis materialize in front of her. 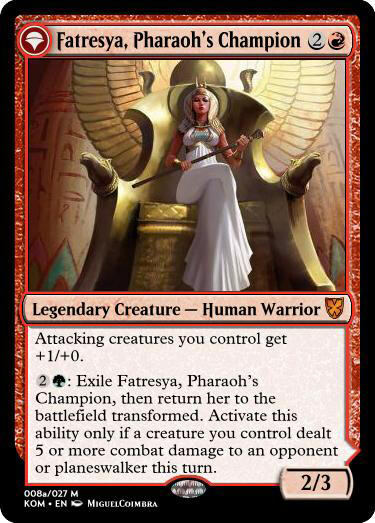 The wards that hid it in the desert had kept it away from her radar for years, but nothing escaped the Pharaoh. 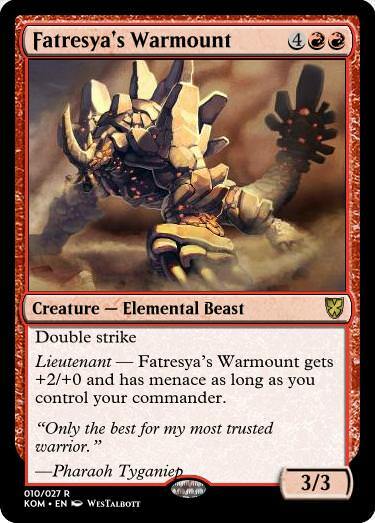 Fatresya smiled, descending from her war mount. “Bring this accursed place down in the name of Pharaoh Tyganiep!” she shouted as she ran with her army towards the oasis. She ran with her sword held up high and clashed against the wardens. This was an Onuris settlement, mostly inhabited by the race of crocodile-men. 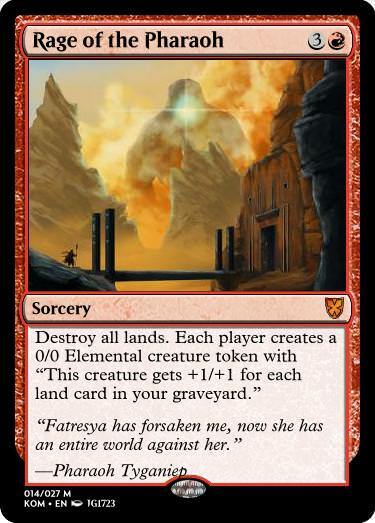 It didn’t matter who lived in the oasis to Fatresya, all that matter was killing them. “Bring the watershapers, now!” croaked one of the Onuris just before Fatresya slit his throat. She saw a group of crocodile-men and humans exit a nearby cavern, and surrounding them was a halo of water, the cursed water that could destroy them. “Be careful, they’ve deployed the watershapers!” she warned as she fended off a few warriors while avoiding a jet of water that shot right past her. She swiftly removed a dagger she had attached to her calf and sent it flying in the direction of her assailant, who was too focused channeling the waters to avoid the attack. Another advantage to the Pharaoh’s boon was the ability to control the sands that infinitely covered the world. She signaled two of her soldiers and they immediately called forth a sandstorm that covered the battlefield. Now or never thought Fatresya as she slid past the wardens and into the cavern. Once inside it she’d cast a spell to make it collapse, drowning it in sand and sealing it permanently. As she let the sound of trickling water guide her through the dimly lit underground, she heard what at first sounded like echoes of her steps, but her enhanced senses realized someone was following her, she had to hurry! She conjured a wall out of the sand and began running towards her target… until she came across it. It was a gigantic chamber in which a broad cataract fell uninterrupted, filling what looked like an endless lake Fatresya could see from the cliff she stood on. It was larger than any oasis she’d ever brought down before, and it was oddly alluring. As she prepared to cast a spell, she found herself interrupted but what seemed to be whispers. She didn’t believe it at first, but it was as though the waters were calling her name. She shook her head and refocused, clearly this had to be some sort of trickery. But before she could start casting her spell once more, she got startled by a sound that came from her back. She turned around to stop the woman that was about to assault her but not in time, and found herself pushed into the waters, pushed to her death! She fell into the lake and began to shake desperately. This was it, those with the gift of the Pharaoh would dissolve after seconds if they contacted the cursed waters. As she felt her whole body disintegrating, she felt a strange warmth inside her, and a vision came to her: it was Rammaneth, only not as she ever could imagine it. She saw the desert painted red with blood, she saw all cities she’d ever been to reduced to dust, and she saw the Pharaoh, standing above this massacre, younger than he’d ever looked, and smiling sadistically over the massacre. She understood immediately: that was the future of Rammaneth, what would happen if the Pharaoh continued his rule. He’d lied, she realized as his spell evaporated, purified by the water. Yes, his “blessing” enhanced those under its influence, but it also drained their lifeforce slowly but steadily, adding it to that of the Pharaoh. They had been his puppets all along! Feeling impotence and rage, Fatresya dissolved into the waters of the oasis. From atop the cliff that hung above the lake, the woman who had pushed her looked down solemnly. “Fatresya is finally dead, good riddance” said Ishtari. It had been at least four years since her ascension, but she was finally here, and her eyes were finally open. As she planeswalked accompanied by a figure at least twice at tall as her, she stared at the sands that extended in front of her. “We’re finally here, Gorandu, this is Rammaneth” she said solemnly. “I just hope it doesn’t take long for them to know I am with them now…” she said with a sad smile. As she finished her sentence, the earth began to shake and a sandstorm brewed. The sand formed into a titanic version of the pharaoh, only younger looking. Its face was filled with loathing in its purest form. 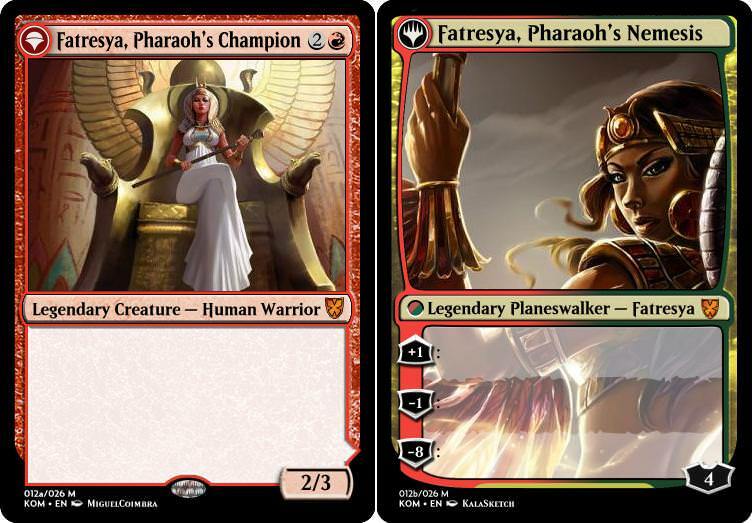 The creature raced towards them, Fatresya was shocked at the summon, since it showed how much power the Pharaoh had gained, but seeing Gorandu standing next to her and ready to battle brought her back. 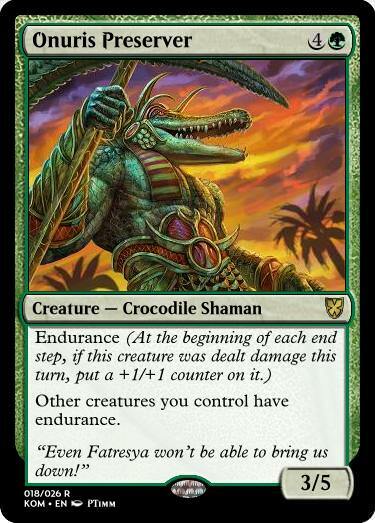 “We will defeat this one first and the real Pharaoh later, do you agree?” asked the Goriana. “Let’s do this!” she said smiling as they both charged towards the colossus. wow working through this but just... wow! well done! I like the thematic throughline of rebellion and the different takes the stories so far have on it. 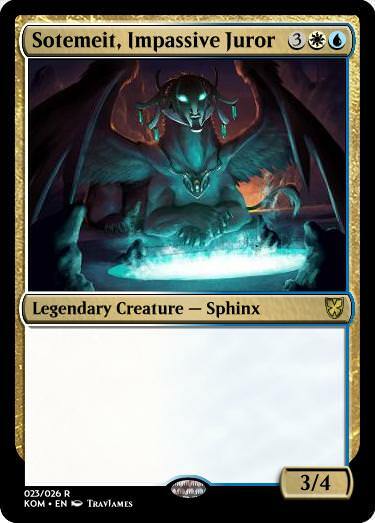 My spoiler, sadly, won't continue that throughline, but the card will still please you all the same. Kellythross woke up half an hour earlier than usual that day, and immediately headed towards his master’s workshop. Today was his big day, the day of his audience with Sibreena. 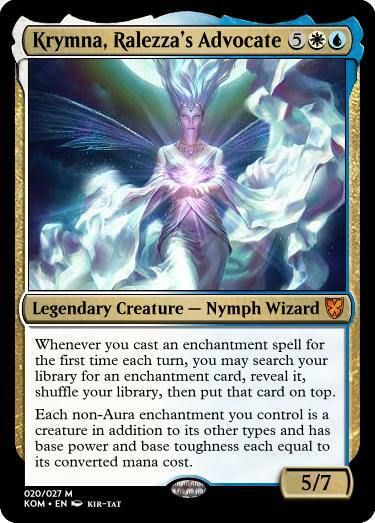 Once every year, the ruler of Demmurya would give a speech about the collective future of the Lubryoss, and then she’d receive some of them personally if their Vollta masters thought they showed any potential. One of them would be lucky enough to ascend to Vollta status, and Kellythross knew he had a high possibility of that being him, for he could not figure anything wrong happening in his future that Sibreena could foresee. 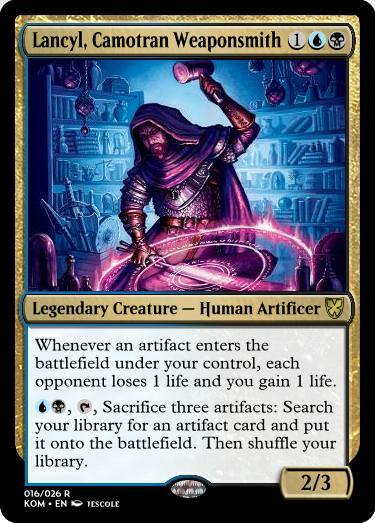 Ever since he was a child, he’d been serving a benevolent vedalken artificer who had noticed a latent talent inside of him, and had nourished it accordingly. 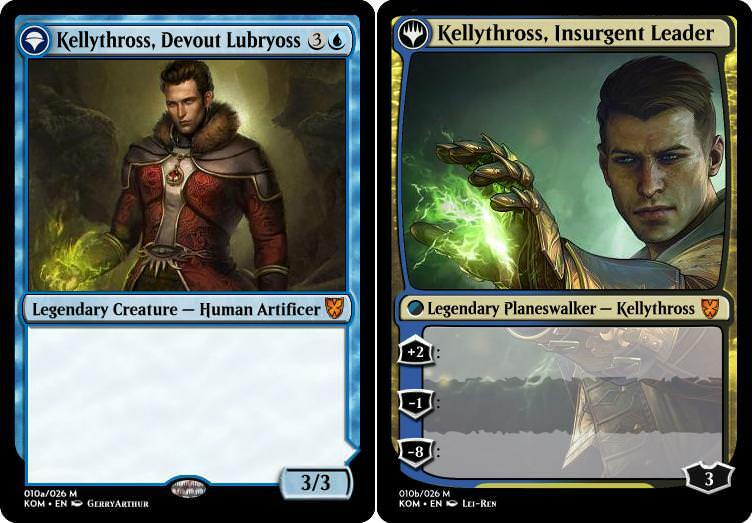 Kellythross had been in charge of reinforcing the defense systems of Speeralis with his innovative creations now that the Insurgents had grown stronger. Not only that, he’d devised something his master ensured would guarantee his status ascension: a special magical gauntlet that could enhance the prophetic powers of the Omenspeakers and battle the psychic interference the Insurgents had developed. 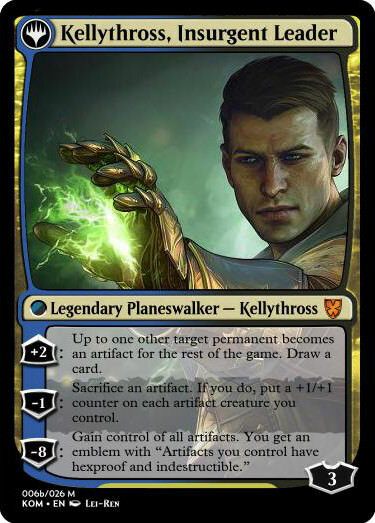 Kellythross knew he could technically update the gauntlet to grant him the gift of Sight, but that would be an insult to the Omenspeakers, so he chose against it. “Are you ready?” asked his master entering the workshop, smiling at the fact he had already started working on something new. Kellythross nodded enthusiastically, he knew he would become a Vollta, he even had thought of his new name once he did (all Lubryoss had to have names finishing with “oss” if they were male and “ossa” if they were female to ascertain their status). He couldn’t remember what happened next, all his memory could pull after that point were an incomprehensible mixture of images, sounds and sensations, some of which involved pain both physical and psychological… his plan was working. He could barely remember his past now, but it made sense, since ever since he’d arrived at this plane he had one simple objective: drink himself to oblivion or death, whichever came first. He could no longer remember why he wanted to forget, but he did remember he wanted to forget something, which meant he still had some way to go. He took another powerstone from his pouch and placed it on the counter. These tiny stones were surprisingly really expensive in this world, and he’d been using them to accelerate his deterioration process. He stood up clumsily and left the tavern. Before he could walk three blocks he collapsed against a wall and vomited, some of it spraying over his clothes. “This is not you” said a sweet female voice behind him. “All due respect, lady, you have no idea of who I am” he retorted trying to stand up straight but falling on his knees. “I do know who you are, and I believe you know who I am” she replied offering him a hand. He looked into her face and, even though he couldn’t entirely discern her features, he realized he’d seen her before. “And why should I trust you? !” he spat at her. “Oh, trust me, you will. And sooner than you know” she replied, smiling for the first time since their encounter. He was left alone, sitting in his own vomit and holding his gauntlet in his trembling hands. He raised it, ready to shatter it against the ground and destroy it forever, but something stopped him from doing so. This was his greatest creation yet, he couldn’t just destroy it out of spite. You need to destroy it, destroy it and yourself, it’s the only plausible solution spoke a voice in the back of his mind. The past few days he had started hearing voices, which he attributed to constantly being drunk, but some part of his brain knew there was more to it than just the alcohol. “I can’t” he said, his eyes watering. He embraced the gauntlet protectively, got up (not without some effort) and headed towards the inn Vorreia had pointed at. The man he saw in the mirror was completely different from what he expected, he hadn’t seen his clean shaven face in years, and it startled him a little. When he turned around, Vorreia was entering the room and she too seemed shocked. “Is everything okay?” he asked. “Yes, it’s just… I kind of liked your beard better” she said, slightly blushing. You better let your beard grow, then said one of the voices in his head. “Excuse me?” asked Vorreia confused. “Is everything set for our return?” she asked briskly, trying to change the subject. “Yes!” He replied with a smile. 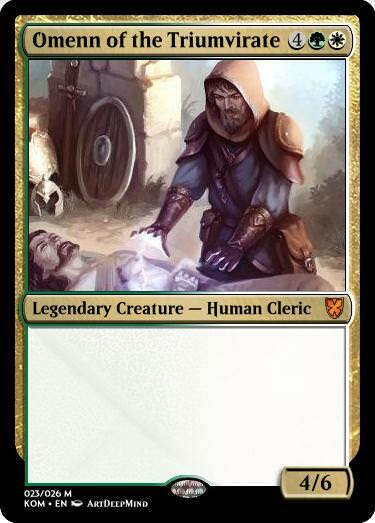 He’d spent the last few days heading to and from Demmurya for tools to rework his gauntlet and some trinkets he’d been working on, and had managed to find a group of vedalken who were actually supporters of the Insurgents that got him materials he had only dreamed of working with! “Yes, I’ve set a meeting with the Insurgents in neutral territory, they’ll set a large number of traps in case we try anything, but I’m pretty sure we have more than enough things to prove we’re on their side… especially this” he said, grabbing his gauntlet. 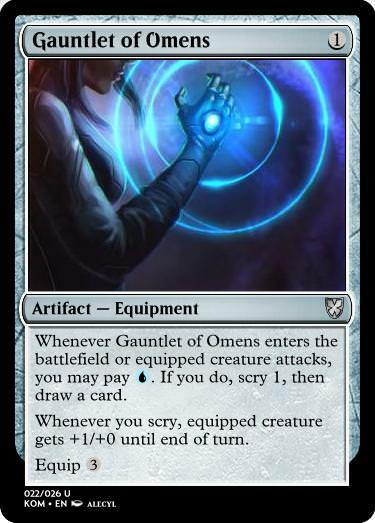 After realizing that his secession from the Omenspeakers meant he could actually use his gauntlet to acquire the gift of Sight, Kellythross toyed with the idea, only to realize he could make more adjustments and use it to interfere with the Sight (Vorreia had been kind enough to be her test subject). 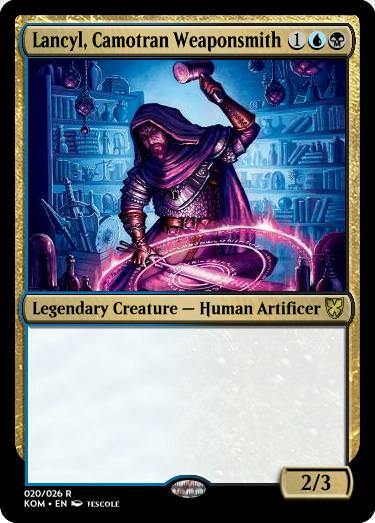 He decided to give up his lifelong dream in order to have a more powerful tool against Sibreena. “Everything is ready then, for the first time the future will be unknown not only for us, but for the Omenspeakers as well” he said, smiling for the first time in years. They held hands and planeswalked together back to Demmurya. 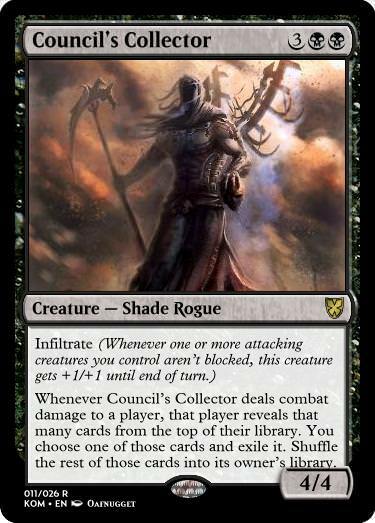 Infiltrate was made by Herzi for his set A Tourney at Whiterun make sure to take a look at it! 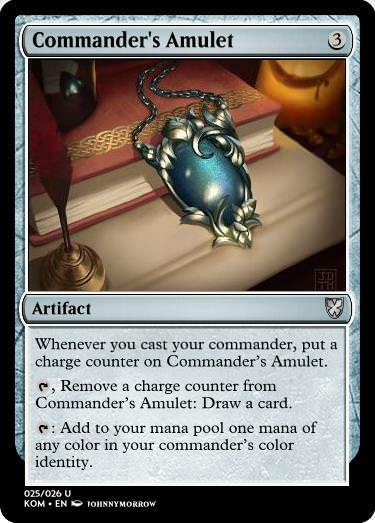 But, since our main focus in the deck is to get artifacts out, how about we look at the other possible commander? She looked at herself in the mirror and liked what she saw: a small, slender blonde woman with vibrant green eyes covered in nothing but a glistening white toga that covered her from shoulders to toes. 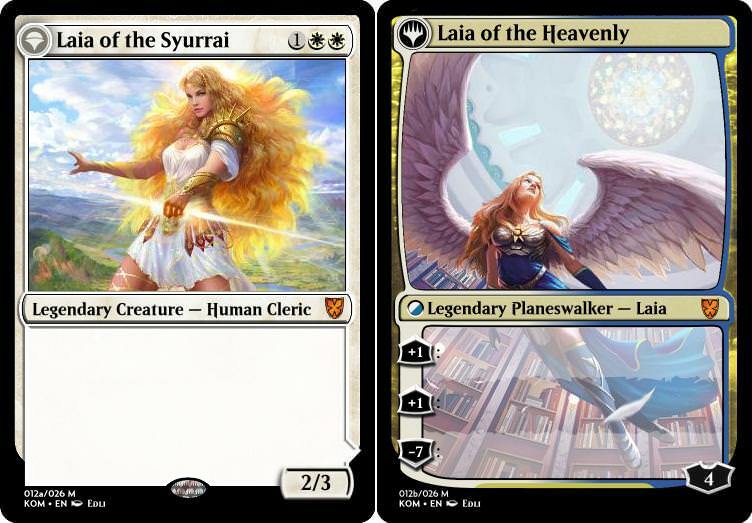 It was the first time she ever wore that white tone and it she was grateful for the cause: today was the day of her ascension. 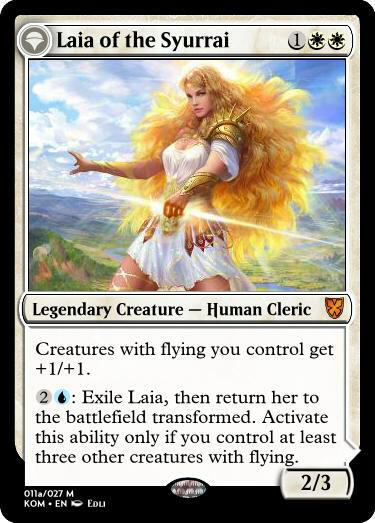 Her name was Laia, and she was from Celestia. The hierarchy in that world was clear: the absolute rulers of the plane were the Heavenly, angels and aven that had been the foundation of all Celestian society, ruled by the High Council. One step down were the Syurrai, Land Dwellers (non-winged beings) who dealt with the Heavenly themselves and were in charge of relationships between both factions. Then came the Vullynos, who worked in the Land Dweller world. Of course not all Celestians could be placed into one of those categories: though technically Heavenly, the dragons did not wish to participate in the Celestian society. Things were at peace with the dragons, but everyone knew it was an unstable peace and a war could ensue at any moment. And then came the Outcasts. Consisting mainly of viashino and goriana, those two Land Dweller races wanted nothing to do with the High Council and their government, and so they kept to themselves (it was obvious they envied those who had wings). Laia’s mother was an angel and her father a Land-Dweller which meant Laia had been born into the Syurrai. She’d been born human, but today that would change forever, for today was her seventeenth birthday. 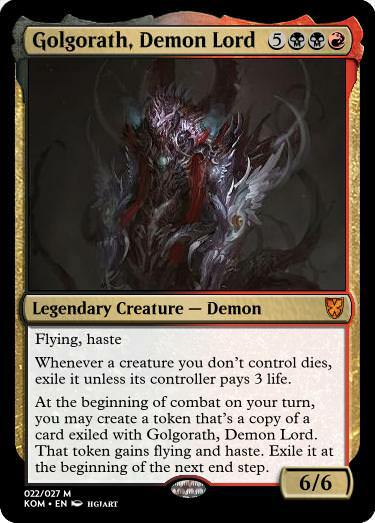 Syurrai who were born from the union between a Heavenly and a Land-Dweller were given a choice when they came of age: spend the rest of their lives as accommodated Syurrai or develop their innate wings and ascend as a Heavenly, meaning they’d have a higher status but more responsibilities. 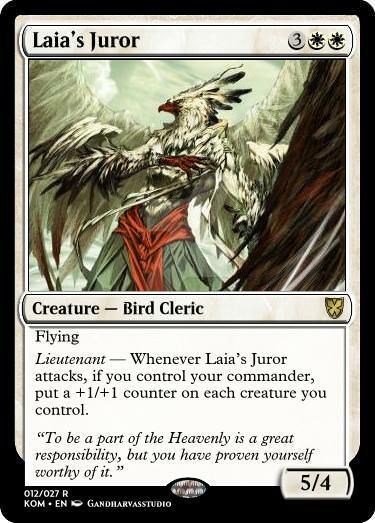 Ever since Laia found out about the system, she’d yearned for her wings, and she was finally going to get them. She entered the ritual chamber and her heart skipped a beat. It was a glistening chamber with gigantic windows at the top that allowed sunrays illuminate every corner of the room. It was a circular structure with eight pillars etched in the wall and holding it together and, standing in front of each pillar, a Heavenly member ready to begin her ritual. Laia almost couldn’t believe her eyes when she saw Moreena standing in front of one of the columns. 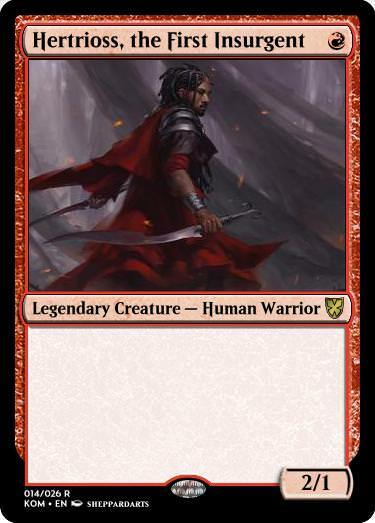 Moreena was the most renowned soldier of the Heavenly army and it was rumored even Volthragos (the dragon patriarch) himself was afraid of her might. It was also said she’d soon be taking a place in the High Council. And yet here she was, ready to help her earn her wings. Laia was overjoyed! She stood at the center of the room, her gorgeous blond mane shimmering under the sunlight as if it were made of crystals. “I do!” she exclaimed ecstatic. The aven stared into her eyes without blinking and asked her a question. As soon as she answered, the platform she was standing on rotated and she found herself staring into the eyes of an angel clad in red. The ceremony required her answering truthfully while staring at each of the eight Heavenly that were evaluating her. They would know if she was lying, but if they found her worthy, then she’d finally become one of them. “Do you have ambition?” asked a pale owl-like aven in a blue toga. She was finally faced with Moreena. The angel was wearing robes that were very similar to those worn by Laia. They stared at each other for a few seconds when the Heavenly smiled and spoke. “I do” answered Laia smiling back. The eight Heavenly looked at each other and nodded. She turned around, her face drowned in tears of joy, to look at her parents, standing in the doorway. Both of them nodded at her with sheer pride. The eight Heavenly that had judged her pointed their hands at her, white rays of energy flowing to and through her. She shook her new wings and began taking flight. It was harder than she’d envisioned at first, and she drifted clumsily across the room, but she began getting the hand of it soon enough and began to ascend at a steady pace. The ceremony would be complete when she emerged out of the hole in the dome’s roof, and the entirety of Celestia would know there was a new angel in the skies. These were definitely not the heavens she remembered. What should be an endless white sea under her feet was instead a dark mass that rose ominously above her, clouds crackling full of thunder. But what scared her the most was not the landscape or the sky, but the creatures that were flying around her: dragons! Could it be? The only logical explanation was that something had happened during her ascension, and she’d been out for a few days. In that short period of time the fragile peace between Heavenly and dragons had broken and the latter had taken control of the plane. One of the creatures seemed to focus on her. 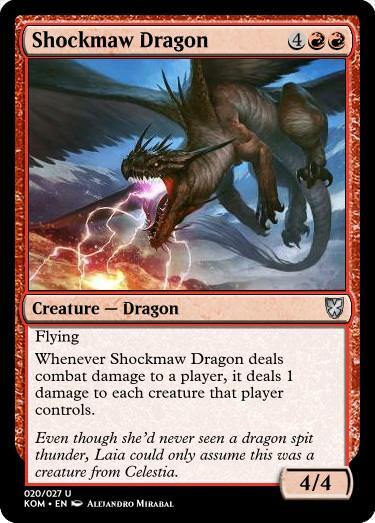 It was a specimen she’d never seen before: it had four wings rather than two, both of them with featherlike scales and it seemed to spit out lightning rather than fire. She tried to fly away but the creature was by far faster than her, and quickly caught up. She did manage to avoid the lightning bolt that flew in her direction, but the creature hit her with its body, and the size difference took a toll on her. She woke up in a comfortable bed a few hours later. She was greeted by an aven with a healer’s gown. Had it all been a dream? She had clearly misheard, or maybe she was delusional, or maybe this was the dream! Yes, it was far more probable for dragons to take over Celestia than for Mirathen to request speaking to her… An hour later she was proven wrong when she actually entered the seraph’s quarters. Mirathen was older than he looked. He was a tall, wizened angel, three immaculate wings spreading on each side and long white hair revealing his old age. 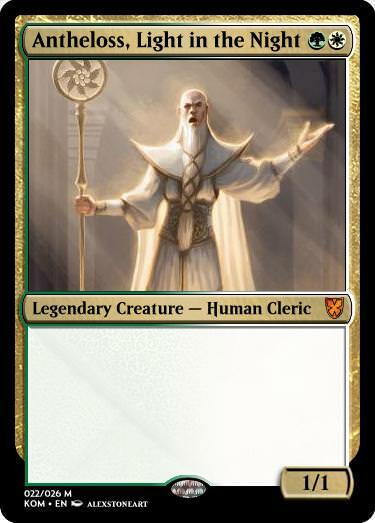 He was the most ancient member of the High Council, and one of the most venerated Heavenly. He’d earned his position by both effort and wisdom. No Heavenly considered themselves worthy of being in his presence, why should she, a new Heavenly be any different? She knelt before him, shaking with expectation. “Raise, my child” he spoke in a friendly tone. The rumors were true, he was a gentle soul after all. “Th-t-thank you, s-sir” she said, trembling slightly. She blushed. He simply smiled piteously and continued. She had to admit she hadn’t. Mirathen gave her a long lecture about worlds beyond Celestia, and wonderful beings capable of walking between them. 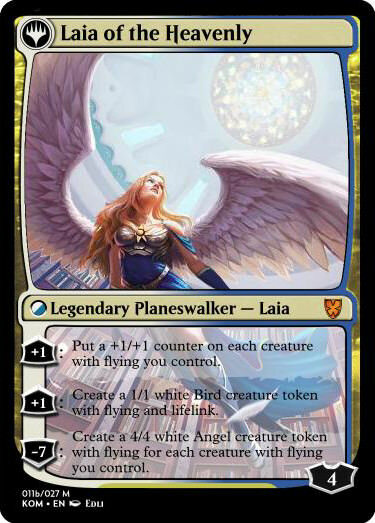 Apparently she, of all creatures, had been blessed with a planeswalker’s spark. The world overtaken by dragons had not been Celestia after all! She did share her discovery with the elder, and his face seemed to lose all amiability. Laia regretted hearing this news. The Celestia she’d hope to be a part of had begun to change the very day she was finally ready to enjoy with her full potential, but apparently there was a silver lining. Now Mirathen would become her mentor, and she was far more extraordinary than she’d expected. Not only that, but that very day the chain of events that would lead her to becoming a part of the High Council and finding love would begin, even if she didn’t know it yet. Yes, there were dark days coming, but she was ready to face them head on! I believe the thing that amuses me the most about mortals is how they think themselves almighty. True, some of them have proven to be powerful, but what use does power have when the sands of time will end up washing you away like they always have. 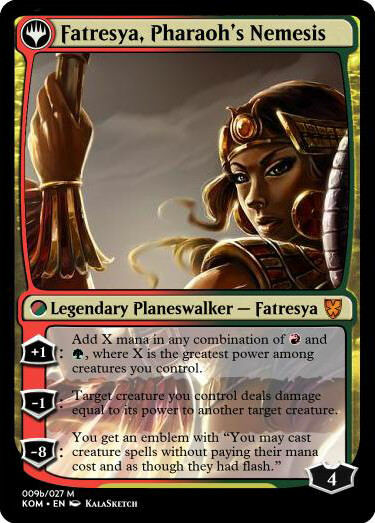 Fatresya and the Pharaoh fight their meaningless war, thinking they are a force to be reckoned with, but unbeknownst to them, this fight is my doing. I gave her that vision, I turned her against her master and she fell for the trap. 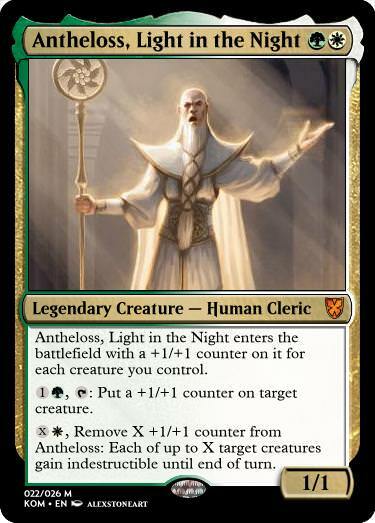 Master and disciple are fighting for control, one for justice, the other for power, and yet they will both fall to the true ruler of Rammaneth: me. That’s the fun in playing with mortals: they think they have a choice over their actions but they don’t realize how wrong they are until it is too late. Fatresya, Tyganiep, keep investing your time and effort in this conflict, you’ll figure out who’s the true victor here in time. “Here’s to you, Queen Elastra, for making Disturbia a better place for all of us, especially myself!” I say to the empty room as I hold up my cup and drink the tastier wine I’ve ever tried. Queen Elastra is finally sitting on the throne of Disturbia, and I am the one responsible for it. We took the throne from Rellekyx himself, but that was going to happen regardless, people were starting to understand that debauchery and unconditional freedom would tear them apart. People needed justice and control, and we brought it to them. 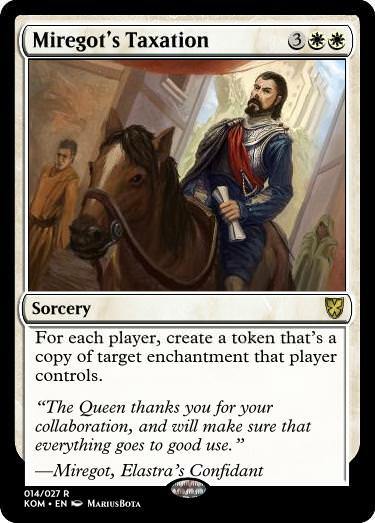 Queen Elastra wanted order, so I gave her the ultimate idea: atonement. People needed to atone for what they did wrong, but not because somebody else told them, because they knew it was the right thing to do! Of course we all would need to follow that, who wouldn’t venerate a queen who actually stood by her word and was not impervious to her own laws? People bought it immediately, and soon enough Rellekyx was brought down by those who had been so devoted to him when he first ascended. Now Disturbia is ours. 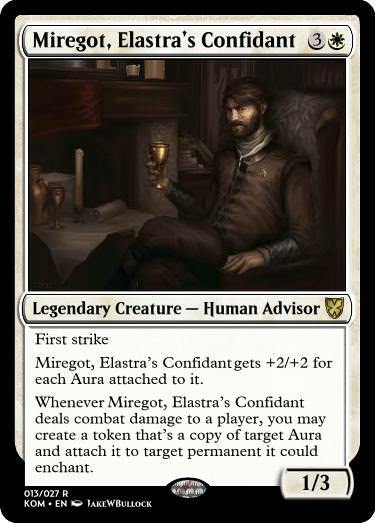 True, it is Elastra who sits at the throne, but I’m the true mastermind. I have no intent to being king of Disturbia, I’ll leave the title and the public image to her. I am more than happy to be the right hand man, the one that stands faithfully at her side while secretly pulling their strings. If people knew the truth, they’d probably riot, but aren’t they better off now? Haven’t we achieved an orderly society? I have achieved a greater good, I am allowed to pamper myself for it. The day wasn’t particularly eventful, just a regular day in Althestra. Inside the castle, after following an intricate pattern of corridors, one could reach the Throne Room, where Thellior sat, a golden goblet full to the brim with blood on each of his rugged hands. He drank emotionlessly as his pale hair fell over his sullen, ashen-gray face. “Boring” he whispered annoyed as he finished his second cup. The mission was clear: a commando of twenty younger vampires would storm the vicinity of the castle, attacking citizens in order to draw the knights out. Once a substantial group had left the castle, Thellior and his twenty most powerful subordinates would enter the castle and seek to kill Thiador, the most elite vampire-hunter of Althestra. If he could fight him one-on-one, Thellior knew it would give him the thrill he so desperately sought! The rackets and the fire in town indicated that the first part of the plan was in motion and it was time to get into action. The Valtrian Castle was a gigantic and sturdy structure, one of the first buildings the humans created when they seized control of the plane, and it had endured through the years. It was believed that all villagers could hide there and survive for a hundred years, but Thellior was about to put that to the test. His lackeys charged against the wooden door for about five minutes before they stubbornly accepted it wouldn’t budge. He grabbed a vial filled with a dark black liquid; it was a special refined blood, meant to enhance both his physical and magical capabilities. He ingested the content and veins immediately started popping inside his body. With a macabre grin he leapt at the door, his fist extended with an ominous aura surrounding it. The door cracked slightly, but that was enough for the rest of the army to break a hole into it and enter. This was enemy territory, and Thellior was about to teach those hateful vampire-hunters what it felt like being assaulted in their own homes. The entrance was clear, the only things visible in plain sight the armors and weapons carefully laid around so each knight could quickly prepare for battle immediately before leaving the castle. The group advanced towards the giant staircase at the other end of the room, scattering everything they found around. They reached the first floor and split into groups to scout. It wasn’t long before they found out it was where the trainee dormitories were. 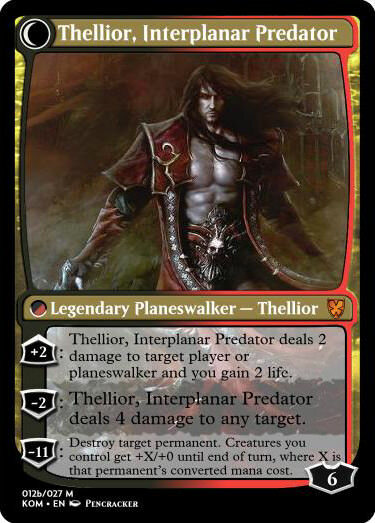 Thellior’s diabolical grin didn’t stop as he mutilated recruit after recruit with his minions, wiping an entire generation of vampire-hunters. Unfortunately reinforcements came before he could finish them all off. “Time to play” he said turning around and facing his new opponents. They were about ten knights, each already clad in glistening armors, swords unsheathed and shields up. 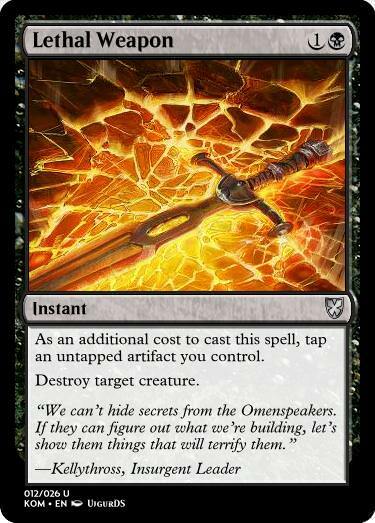 Thellior reached for his belt, extracting two daggers made of polished bones and rotating them dexterously. He plunged forward and engaged three hunters at the same time. 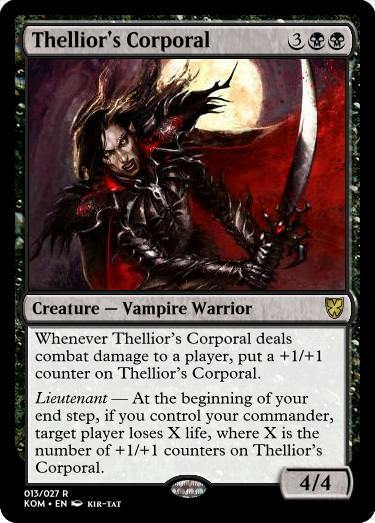 The first one struck as soon as the vampire got into his radius, but Thellior was expecting it and swiftly dodged him. With another quick movement he placed his arm around his opponent’s neck and got behind him while turning him around, creating a meat shield. The two other knights hesitated before striking at their friend, and the vampire used those seconds to kick his victim’s back, pushing him towards the other two enemies and making the three fall down to the floor. He heard a swish that indicated a sword was heading his way. He kicked himself upward and, with a graceful midair pirouette, he made strategic cuts in the man’s unprotected places, his daggers penetrating deep enough to cut crucial arteries and bleeding his foe to death. He landed immaculately, licking the blade of his weapons and rejoicing on the taste of blood. He saw the three men he’d previously faced charging at him out of the corner of his eye. He cackled softly and threw one of his daggers at the knight closest to him. The projectile flew with so much strength it pierced the head plate and embedded in the man’s skull, killing him immediately. 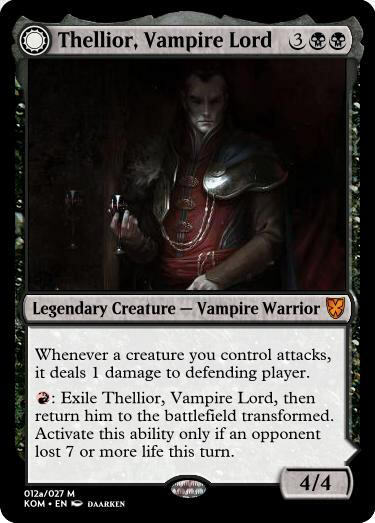 The two remaining vampire-hunters charged as one, striking so quickly Thellior found himself too busy deflecting the strikes to be able to attack. That was the fight he’d been waiting for. For the next few seconds he simply avoided strike after strike while studying their fighting pattern until… Eureka! He saw an opening and took it. As he bent backwards to avoid both swords heading for his heart, he raised his foot, kicking the weapon out of his enemy’s hand. Without missing a single heartbeat (not that he had one) he grabbed the knight’s arm and applied enough brute force to crack all its bones. The man fell to his knees screaming in pain and Thellior jumped towards his last foe. It was gruesome. The vampire wrapped his legs around the man’s thorax and placed a hand on his face. He pressed against it, his fingers penetrating the eye sockets and forcing the eyeballs to explode. Thellior immediately began biting the knight’s neck and swallowing gushes of blood until his mouth looked like a red sea. “Stop this madness!” spoke a stern voice. He turned around towards the source and saw the man he’d longed to confront for so long: Valakor, the most elite vampire-hunter in Althestra. He was around forty years old, although his hair was grizzled and his face weathered. He had a considerable amount of scars he’d earned through the years but they seemed to only make him mightier. His face was completely expressionless. “We’ll settle this once and for all one-on-one” said Valakor without a single muscle in his face twitching. Thellior smiled and cracked his neck, then charged. He moved with uncanny speed, too fast for any human to follow, or so he thought. When he was a few meters away from the man, he jumped, releasing a few kicks that Valakor deflected effortlessly with his shield. Don’t think you can keep up with me thought Thellior as he landed while his arm descended while holding a dagger that was ready to sever the man’s head off. But the knight simply ducked and thrusted his sword towards the vampire’s stomach. The creature was caught off guard and had to quickly step backwards to avoid the strike, losing his equilibrium. 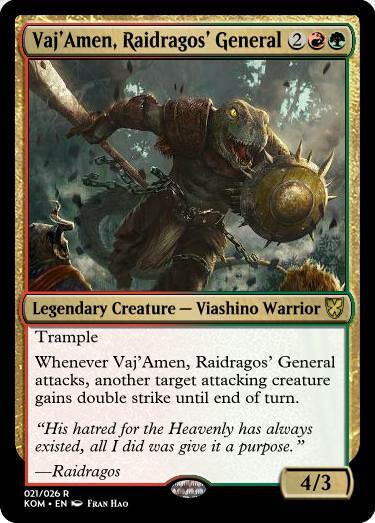 Valakor used that as an opportunity to jab at his face with his shield. A horrible crack was heard, and Thellior staggered backwards as his head buzzed from the pain. This was unreal! He breathed heavily as his face contorted to an angry grimace, and he pulled three vials of his refined blood. He’d never taken so much at the same time, and was unsure of the consequences, but he was not going to surrender to this mortal. He swallowed the black liquid and started screaming and laughing at the same time as his ashen skin turned pitch black and his muscular mass increased to the point it ruptured his clothes. His eyes bulged to the point he felt they would fall off, and his hair thickened, giving it the aspect of wire. Thellior ran towards his target with both arms extended, breaking the stone walls that surrounded him as he advanced. Valakor remained impassive. All he did was raise his sword and wait for the right moment. “Luthgra” he spoke when the vampire was a few meters away. The knight’s weapon began glowing and a beam of white light shot from its tip. Thellior was sent flying backwards as the rays burned his skin and forced him into his usual form. How could a mere man defeat a vampire lord. He tried to get up but his energy was abandoning him. 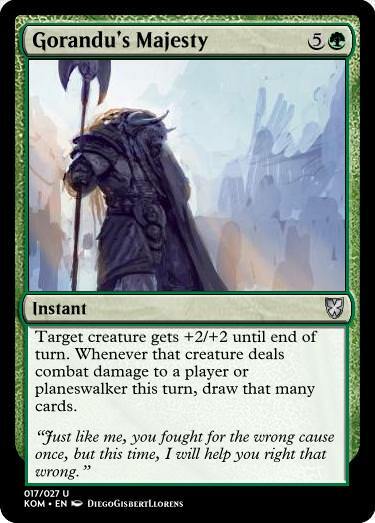 That phrase added insult to injury, and Thellior wouldn’t take it. Something stirred inside him, and he found his second wind, standing up and drawing a his favorite knife. 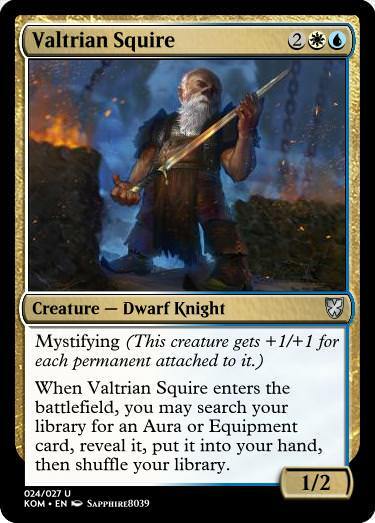 “So be it” said Valakor. Vampire and man ran towards each other, weapons held high, ready to tear the other one to pieces. When they were close enough both blades descended at the same time, but something didn’t seem right about the situation. The same energy that Thellior had felt kept increasing inside him. It wasn’t just a second wind, it felt like so much more, unnatural even. Was this a side effect of ingesting three vials of refined blood? Whatever it was, it was blurring his vision. Valakor was slowly fading away, being replaced by darkness. Maybe he was going to faint, maybe his body had just given up, but it definitely didn’t feel like it. His knife finished descending and he heard a scream, but it wasn’t the one he’d expected. This scream had come from a woman. The body fell to the ground. She looked like a simple villager, but her clothes were odd. He checked his surroundings and was confused. Where was the village he remembered? Where was the Valtrian castle? He fed on the corpse he’d left behind and then headed towards the village in order to find some answers. 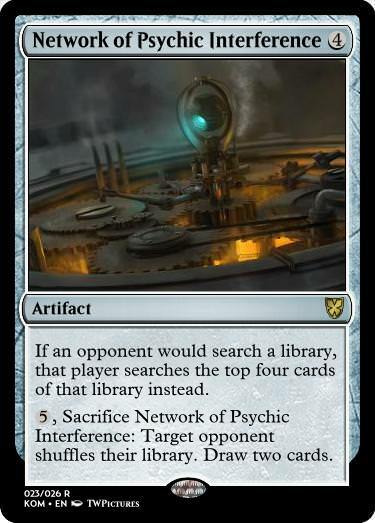 He found the answers in the next few weeks: Innistrad. This brand new world was similar to Althestra but it had a crucial difference: vampires were more feared and respected. Unfortunately there was a catch: one of their own had betrayed them and created an angel to protect humanity, pathetic. If Thellior wanted to fight angels and humans he’d remained in Althestra. 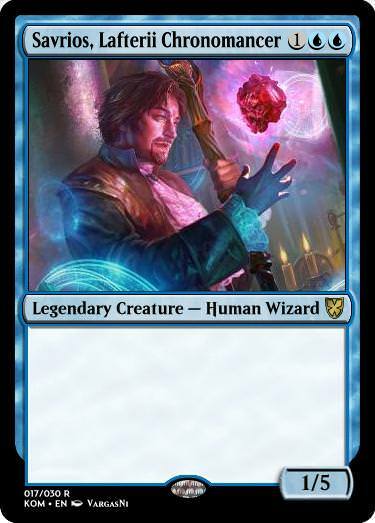 No, he needed a new challenge, but there was a silver lining, for he’d learned he was a planeswalker, and that meant he had the ability to travel to countless worlds. 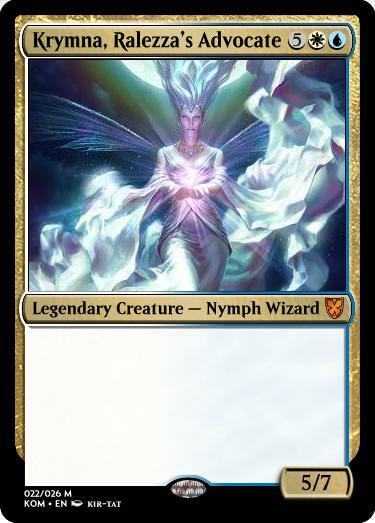 And so the hunt began: Nimunot, Theros, Disturbia, Celestia, for years he traversed the Multiverse in search of new challenging hunts. The more he saw, the more he wanted. Soon he’d be the most feared predator in the entire Multiverse. He knew he’d have to return to Althestra eventually, for he was a key piece to keeping the Eternal Seal standing. But in the meantime, why shouldn’t he enjoy the hunt? He spat on the sign and dropped it, and it began slowly burning to ashes as it fell. He simply entered the tavern and was greeted by the overweight bartender. “How’s the most wanted man in Okthuros doing?” he asked mockingly. The bartender poured him a glass of whisky and gave it to him. The man’s silence was all the answer he needed. And right he was, as he was proven immediately after exiting the tavern. 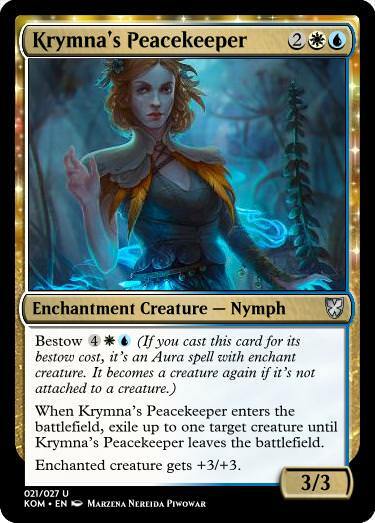 At the door stood the Weaver Krymna, followed by an entourage of peacekeepers. “You do realize those were the exact same words your minions said before I injured them, right?” he replied taunting. Krymna began to surround herself with a bright pale aura that shot at the pyromancer. He reacted quickly and placed both his hands forward, igniting the spell as is came into contact with his palms. 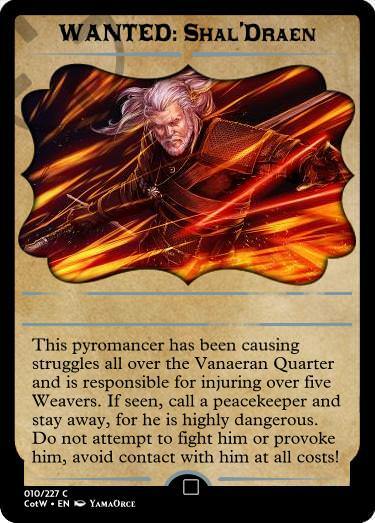 Before Krymna could respond, the man ignited, sending a wave of flame in her direction. Drawing energy from the Weave, the nymph created a shield around her and her party. The shield absorbed most of the hit but, to the Weavers’ surprise, some flames managed to drill a small hole in their defense. Even though they snuffed out before hitting anybody, Krymna was shocked. 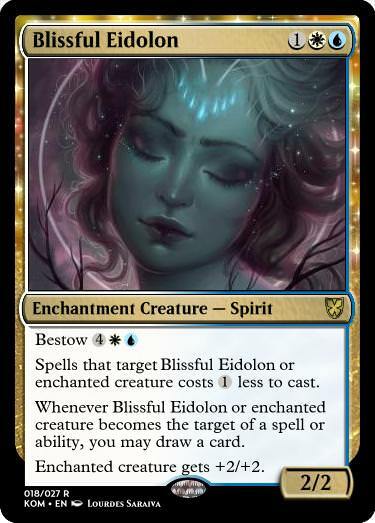 The Weave was a spell that had warped Okthuros forever. 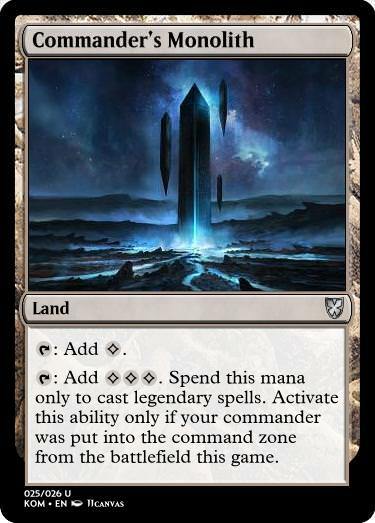 A planeswalker had cast a massive illusion over the entire plane, submerging it under a mantle where a new reality was established, and very few people knew about this. Those who did knew their current existence was a metaphysical manifestation of their consciousness within the Weave, and couldn’t know where their real bodies were. But that was not the only thing that had changed with the Weave. 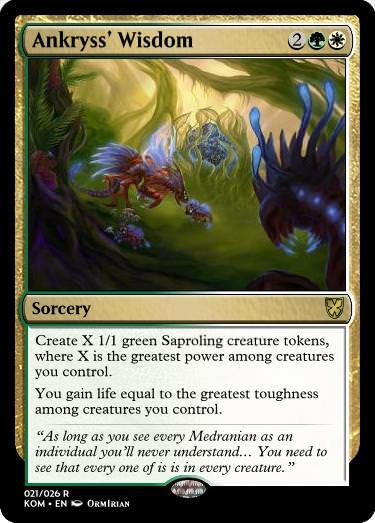 New creatures had been born from it, and they could wield it at their leisure. 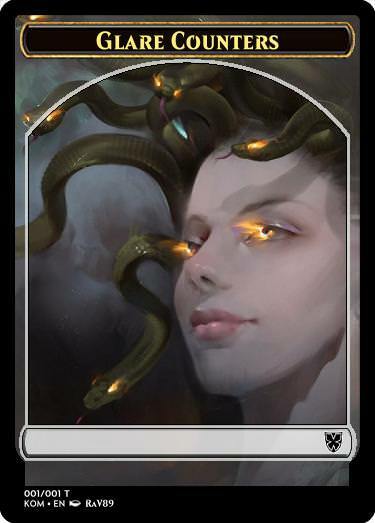 Krymna and the other nymphs were among those creatures, so if the Weave was destroyed, it was highly likely that they too would be. She muttered a small incantation that granted her wings and flew away from a fireball that was heading straight to her face. Shal’Draen retaliated by summoning five new fireballs that headed at her from different directions. She spread her hands and distortion waves emerged from them, twisting the attack until it dissolved into nothingness. The man was fast, and he thought on his feet. If her plan was to work, she needed to distract him, even if it was at the expense of her own wellbeing. She shot towards him quick as an arrow and, before he had time to react, pinned him against a wall and started muttering a restraint spell. 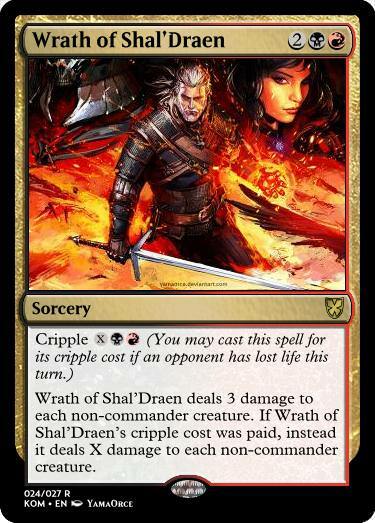 “Oh, what a stupid, stupid choice!” said Shal’Draen with a malicious smile. 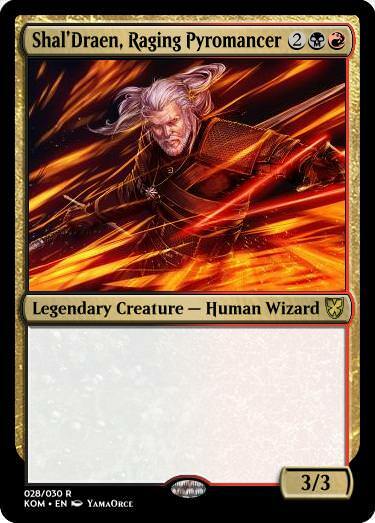 His eyes began glowing, his hair started raising on its own and his body ignited as he unleashed a destructive nova that sent Krymna flying away while she burned. 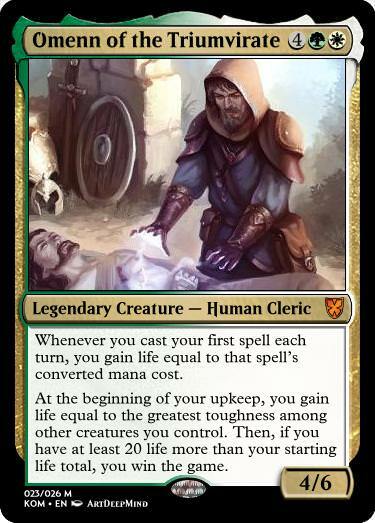 Cripple was created by herzi for his set A Tourney at Whiterun make sure to check it out! “Now!” she screamed before she was immobilized by pain. 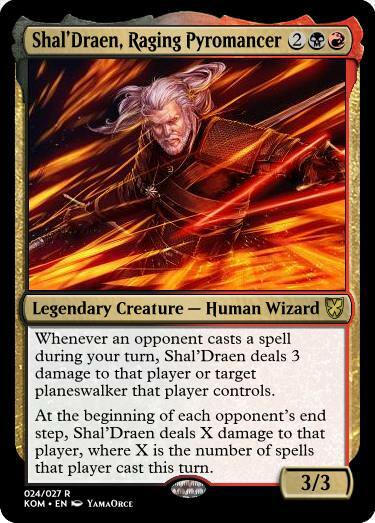 Before Shal’Draen could react, he felt something surrounding him, not something physical, but more of a strange force that suppressed his fire and forced him to his knees, immobilizing him. “Good job” he heard someone speak. He couldn’t move his head, but he immediately recognized her voice. Ralezza ordered him to be taken away, as she headed to Krymna and ordered some peacekeepers to tend to her wounds. 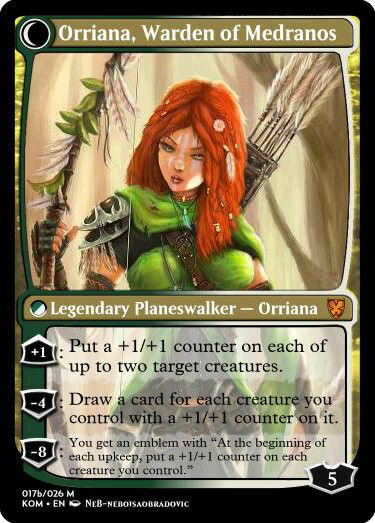 Orriana’s first arrow flew straight through the trees and hit a hanging fruit, impaling it against another tree. The second one flew a little higher than expected, hitting the same tree a few centimeters above the fruit. Orriana sighed and prepared another arrow, but her teacher interrupted her. “What is it?” she asked annoyed. “Yes, ma’am” bellowed Orriana, trying again, and failing yet again for the next few times. It wasn’t until almost an hour later that, exhausted, Orriana finally managed to accomplish her task. 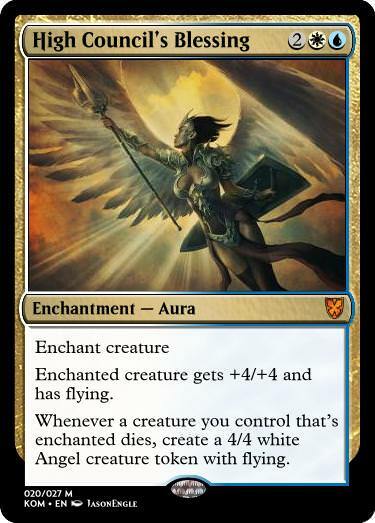 Orriana’s smile immediately vanished. This had all been based on nepotism and not on talent or potential? Did he pity her that much that he had to-? “I’m just joking” said Ankryss laughing hysterically (an unpleasant noise given it was a series of insectile cackles) “I chose you because there is something hidden inside you I can’t describe. You’re full of potential, Orriana, and I think you’ll fit the role perfectly. And so the weeks passed, and Orriana kept training. From shooting ten consecutive arrows and landing them all in the same spot to hitting moving targets while jumping from branch to branch, her archery skills began improving exponentially, until she was finally ready to hunt a sprareos. 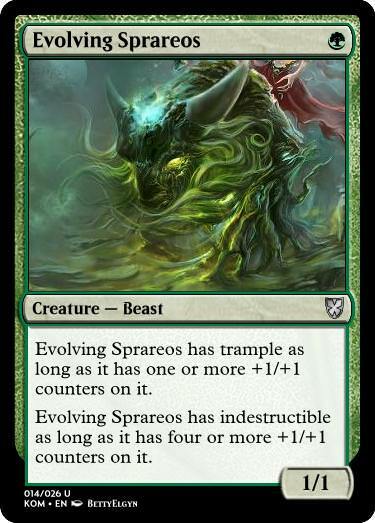 Sprareos were a unique breed of beasts exclusive to Medranos, spreading life wherever they went, and growing faster than any other Medranian creature. A sprareos would only take a few hours after being born to take the size of a full-grown bear, and after a week, it could potentially be as tall as a tree. 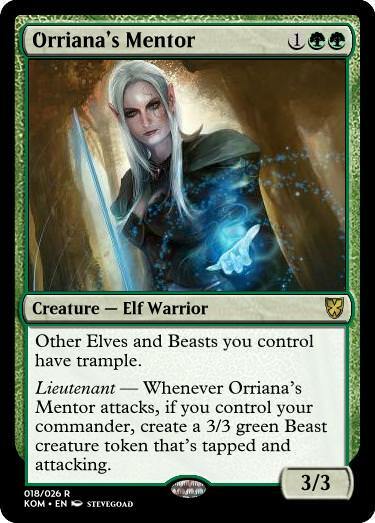 If Orriana could bring one of them down on her own, her mentor would know all of her training had paid off. “Gotcha” she whispered when she heard a small tremor. 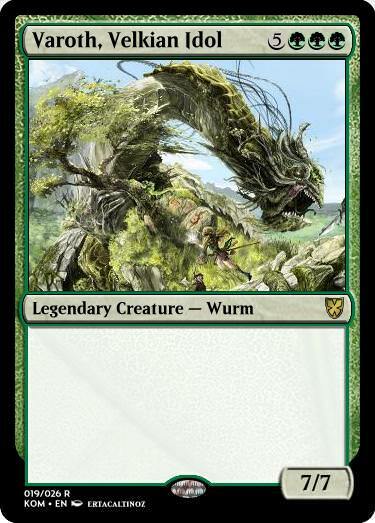 A sprareos was close, camouflaging itself with the endless trees of the Eternal Fronds. She shot ten consecutive arrows to occupy a wider area, and the grunts she heard indicated two of them had hit her target. The beast began running away, and she climbed on top of a tree and began chasing it. She couldn’t tell what happened to her arrow since she hit her abdomen against a branch she could’ve sworn hadn’t been there before. As the shock and pain left her breathless, she began falling, hitting against multiple branches until she finally fell on the floor. She got up cursing and realized something odd: all the trees seemed… wrong. Their shapes, colors and sizes were unlike any she’d seen before, and there were so little trees. “Are you alright? That looked like quite a hit you took” asked a hoarse voice behind her. 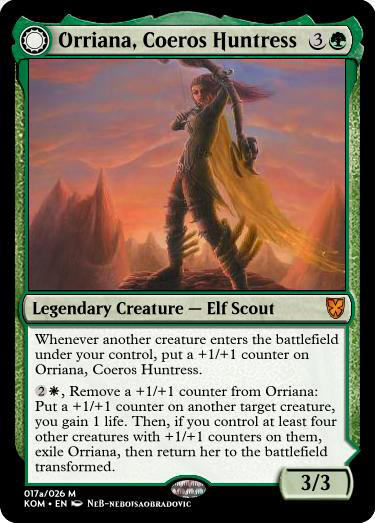 Orriana turned around and saw what looked like an elf, only taller and much more muscular. But something was off about him, his ears were misshapen, and his clothes looked odd. The strange elf eyed her from top to bottom. “A what?” she asked, unfamiliar with the term. 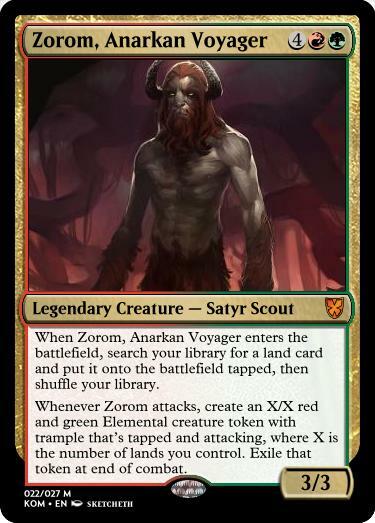 Garruk grabbed her and looked at her straight in the eye. Orriana began slowing her breath, and did as told. 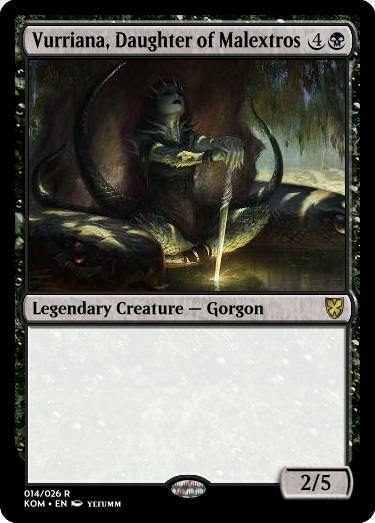 Garruk released her and began explaining. Orriana wasn’t sure what to choose. She didn’t pay attention to details, she just lived in the moment… but she did pay attention to Ankryss. As she began evoking the memories of her friend, she could feel herself being pulled away from this world. 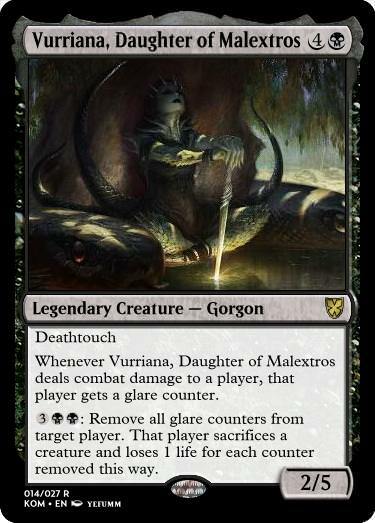 “Thank you” she whispered at Garruk before vanishing. As she smiled and hoped to meet this man again, Orriana returned to Medranos. 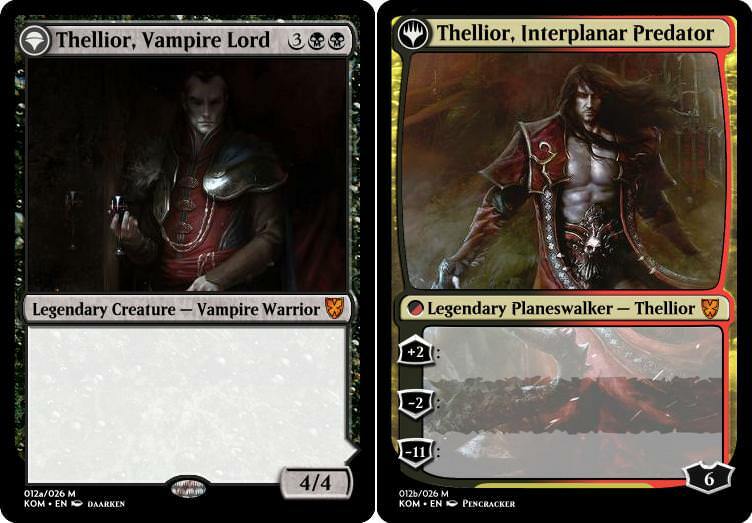 And finally, as always, the two alternative commanders for this deck! 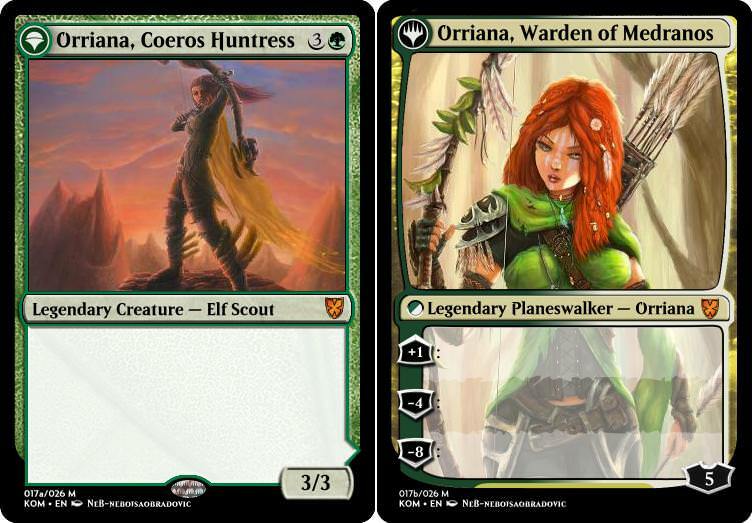 And those are all the commanders, hopefully I'll update the set files (including decklists) by next Monday, so stay tuned for that! THE TIME HAS FINALLY COME FOR ME TO SHARE THE DECKLISTS, ENJOY!!!! As always, suggestions and critiques are both appreciated and encouraged. Also, here's the set file with all the cards! The set has a total of 345 card, with 106 of them designed specifically for this set. 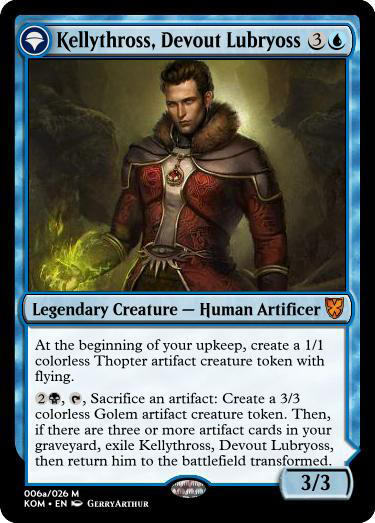 All of these 106 are now officially legal to play in both Korakhos Commander and in Korakhos Vintage!